All this talk of the whole rear end being supplied by RedBull to Toro Rosso forgets to menbtion that many other parts will come too. The drive train, gearbox and front suspension could be the same too. Only the chassis has to be designed by themselves and not another current racing team or a previously raced chassis ( of another team) either. I think Given will be very similar to Red Bull chassis they will be a competitive outfit! Midfield fight is going to have a lot of teams fighting together imo. As Red Bull will join Toro Rosso in using Honda engines in 2019, the junior team will use a Red Bull-designed rear-end as well as some front suspension parts. Marko said it was not logistically possible for Red Bull to produce enough parts for four cars without compromising pre-season preparations, but said Toro Rosso, which finished ninth of the 10 teams in 2018, must still target "fifth or sixth place". "The whole thing was made easier by the whole engine question. "The complete rear end is from us, everything that is permitted according to the regulations. Reading this article and looking back at the end of last year when Honda introduced the Spec-3 but encountered some vibration issues on the STR13. I can now understand that nobody was really panicking about this issue because the test rig was probably already more engineered towards a RBR integration. What is the maximum limitation here? We know wings/bargeboards/brake shrouds need to be new for 2019. Most internal parts are probably designed around the Renault installation. Other than suspension, PU, and brakes, what could the 2019 STR use from the 2018 RBR? The back of the RB14 was build around the Renault PU and now the TR14 needs a rear designed around the Honda, but they get the Renault design. Dont' believe everything that big bullshitter Marko says anyway. It seems some Marko fangirl (Or Helmut himself?) rated my message as baseless although it's based on facts. What you say was true for the past, so the downvote was not necessary. But in 2019 they aim for even tighter cooperation. Speaking to Autosport, he said: "It was stupid, why should we make our own gearbox when we can get it from Red Bull? "We have a synergy project, we have the rear end, we have parts from the front suspension, that's it. "It's just totally simple, we have the Honda engine, we put on the Red Bull Technology gearbox, nothing more to say." Committing to the same suspension will also mean that the two teams are likely to converge on an aerodynamic approach. "We will have a very close cooperation with Red Bull Technology next year," said Tost. "Because we will have the same rear part, which means the power unit, gearbox and the suspension - everything within the regulations - because we want to use this much. "The front suspension as well, the inner parts, not the outer parts, that's all. "But that's a lot, because you know the complete rear part means also the hydraulics, the electronics, all this kind of stuff." Usually, though it uses the same gearbox internals as Red Bull, Toro Rosso has opted to provide its own casing. 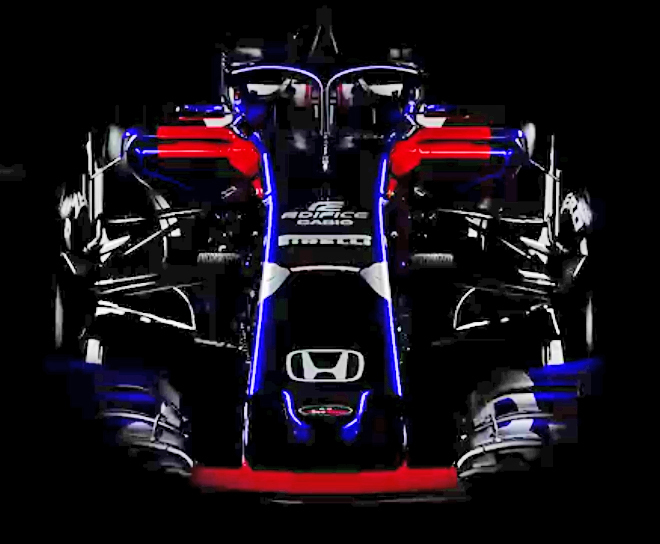 This year however, both will run the same rear end including suspension, a move which Honda believes will greatly aid the Japanese manufacturer. I think they will use as much 2019 parts as allowed to decrease costs and also make it easier for Honda to push on the engine side. 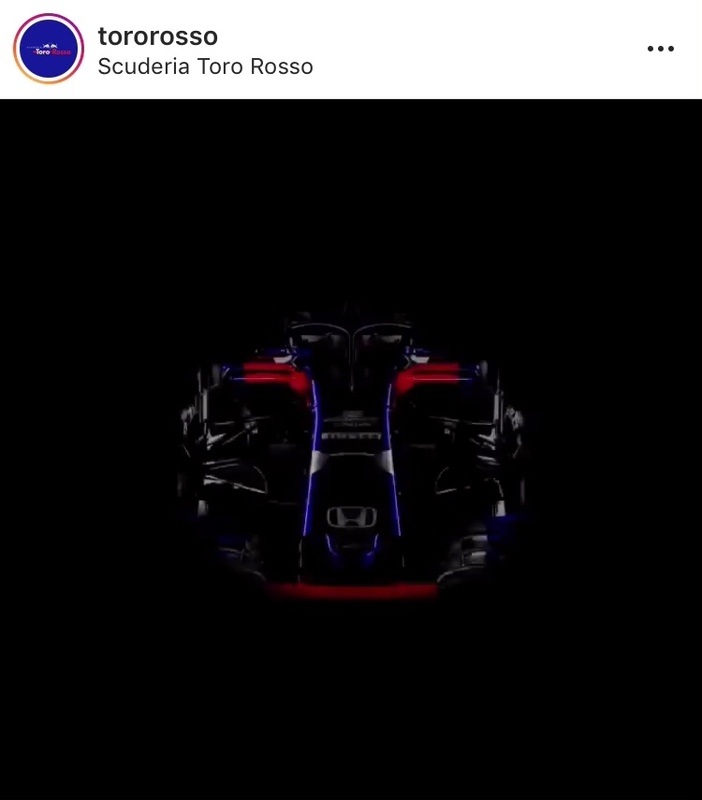 I would'n t be too surprised if the STR14 will look like RB14 in terms of aerodynamics. Livery will be the same, this is the 2018 car though. How does anyone know if the livery is going to be the same? Based on photo comparisons between RB14 and STR13, I am of the opinion the biggest improvements for the STR14 may likely be the front suspension arms and the suspension hardware (namely the front hydraulic j-damper). The RB14's suspension arms were also far less bulky than the STR13's. Launch will be 14:30 CET. Friendly reminder we will be closing this topic 14:30 CET due the car launch event. A soon as we have official media, the official car thread will go open.